Mr. Blue, Mr. Black, Ms. Pink, and Ms. Yellow are still available! 1) Maxwell Family: Ms. Purple "Ellie"
Vet exam 3/28 went great! Everyone is a healthy bundle of sweetness! Ms. Pink:: Pink Scarf Girl is the smallest pup in the litter at ***bs! She is independent and sweet, normally letting a sibling take the lead when exploring something new (though she was the first pup to befriend the cat)! Because of her smaller size and reserved nature, she would likely do best in a calmer household that can build up her confidence as she matures. Mr. Blue: Blue Scarf Boy is middle sized for his litter at ***lbs. This little fellow has an endearing personality! 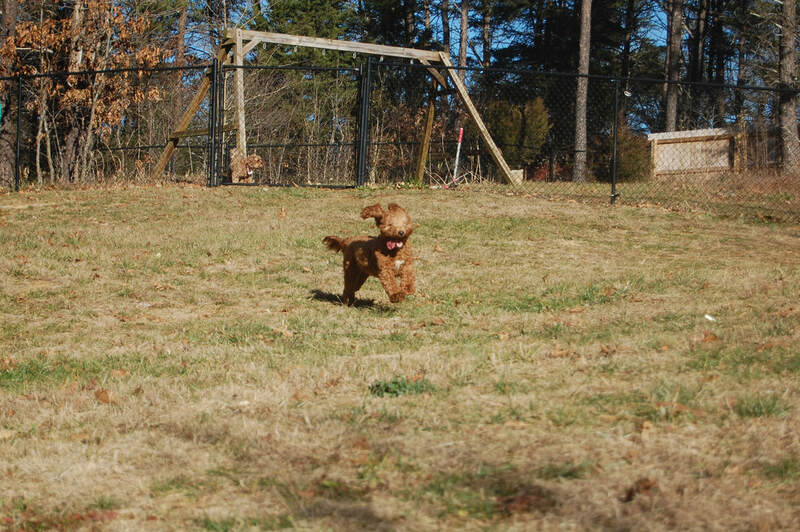 He is adventurous in super playful, he would do well in a home that has another dog, or can offer regular play dates. He loves being petted and stroked, and is happily trusting of everyone he meets! He makes great eye contact. He will do very well in any household (family or single person). Ms. Purple: Purple Scarf Girl is a sassy, silly gal! She is a chunk at ***lbs, but her build is short/stocky compared to her siblings. She is adventurous, confident, and a lover of all other dogs and people. She is expressive and photogenic, making good eye contact. She will do very well in any household (family or single person). Mr. Black: Black Scarf Boy is the smallest pup in the litter at ***lbs. He is energetic and loving. He is a very happy boy that just seems to be smiling and happy all the time. His favorite thing in the world is to play and cuddle with any human, big or small. 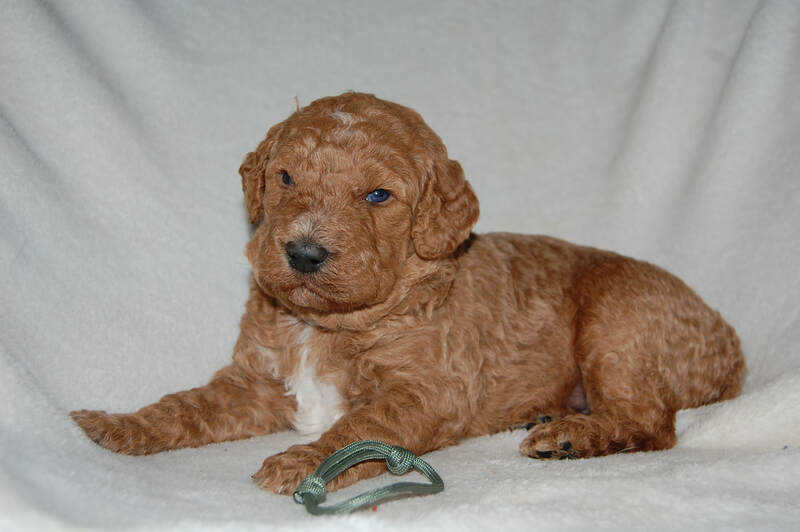 He has a soft curly coat.He will do very well in any household (family or single person). Mr. Green: Green Scarf Boy is the biggest fella in the litter at ***lbs! He has a very stocky/square build, and I expect that he will end up 40lbs+ as an adult. He has a confident, middle of the road personality. He loves food and cuddles, and plays well with his siblings despite his size. He is a gentle giant! He will do well in any household (family or single person). 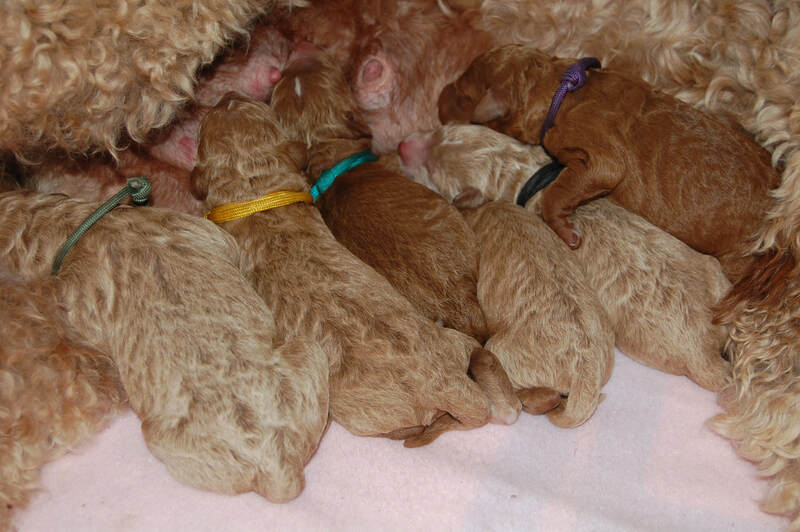 Ms. Yellow: Yellow Collar Girl is middle sized for her litter at ***lbs. She is sweet and confident, and has a middle of the road temperament compared to her siblings. She is feminine, and has white markings on her chest. She enjoys both human and canine attention, and will even flip on her back for belly rubs! She will do well in any household (family or single person). Thanks for your patience this week! 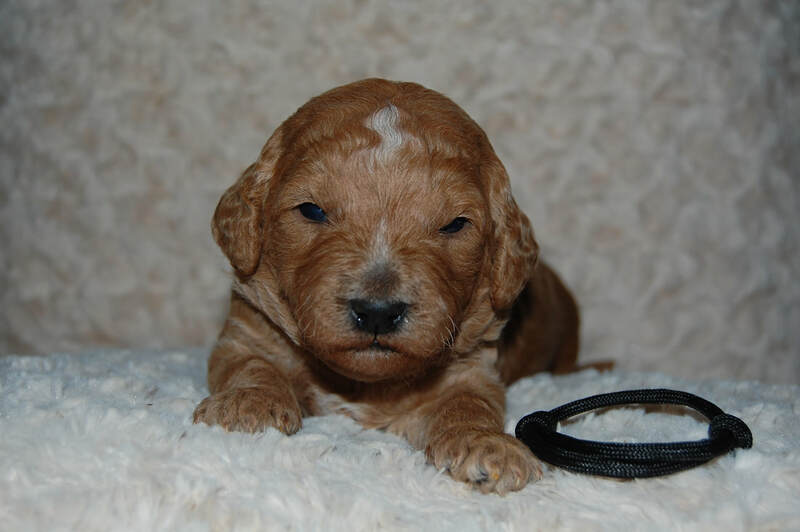 I have updated the puppy gallery (view the "litter gallery" using the link above)! ​Can you tell that they have grown? 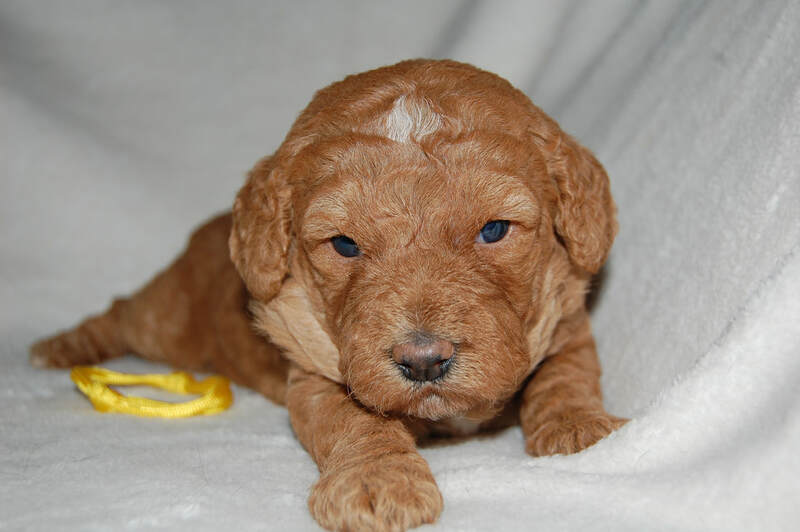 Updated the puppy gallery (view the "litter gallery" using the link above)! At 2 weeks old we have peepers... eyes are beginning to open! 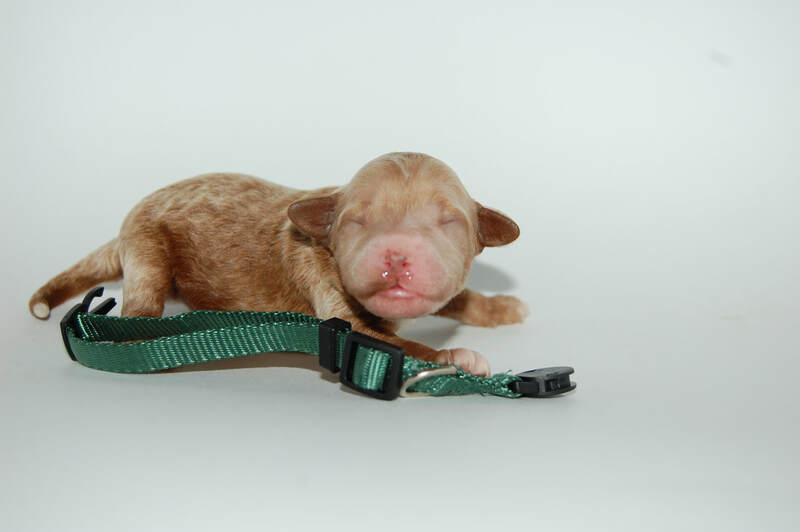 Mr. Green collar boy (the SUPER chubby fella) was first to open his eyes. Ms. Pink is taking her time, it may be another day or two for her (but give her a break, she is a little bitty gal). All of the pups are beginning to wiggle about the whelping box, and mommy is pending more time outside of the box... she even rode to the bank with me this morning! We have one last week where life is all about pooping, eating, and sleeping- then we will start seeing them play! Let the fun begin! 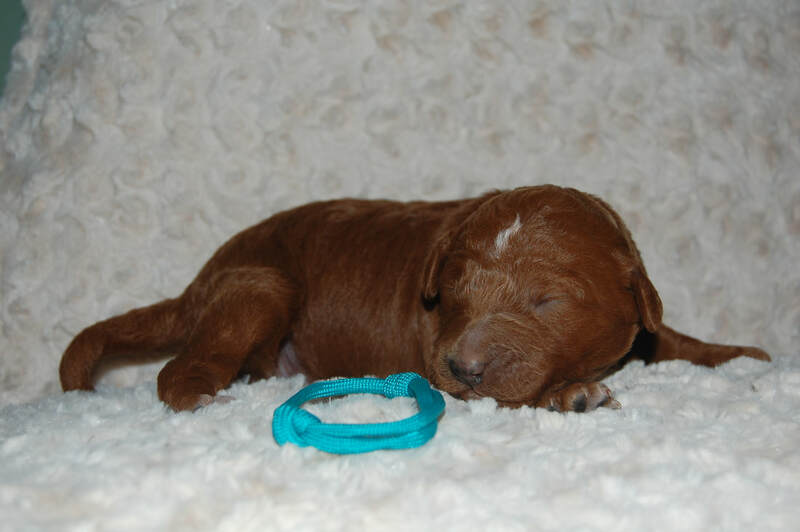 Updated puppy pictures (view the "litter gallery" using the link above)! Oh my goodness, one week old already! I added a couple new photos to the litter gallery (view the "litter gallery" using the link above)! Mommy and babies are doing well. Little Ms. Pink is still much smaller than her littermates, but gaining weight every day. Penny is a wonderful mommy! Her one "rule" is that the whelping box has to have one spot that isn't covered by the whelping blanket so that she can lie on the cool floor. One more week of eating and sleeping, and then they will begin to come to life! Added a couple new photos to the litter gallery (view the "litter gallery" using the link above)! 02/19/18 - Happy Birthday Babies! 12:50 PM: Finally, progressing! She is in active labor with noticeable contractions. 1:19 PM: Ms. Pink! 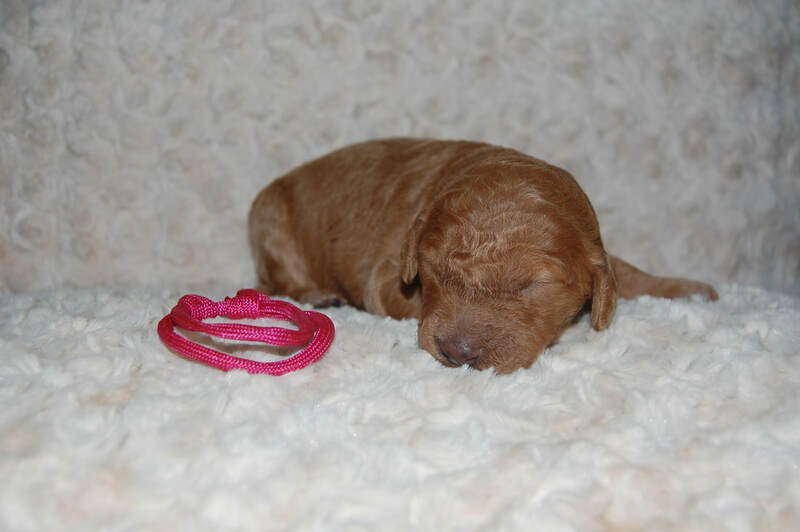 Curly solid red/apricot female pup born, smaller than expected 225 grams. 1:32 PM: Mr. Blue! Curly red/apricot with small white markings male born, 314 grams. 1:50 PM: Ms. Purple! Curly red/apricot with small white markings female born, 307 grams. 1:59 PM: Mr. Black! 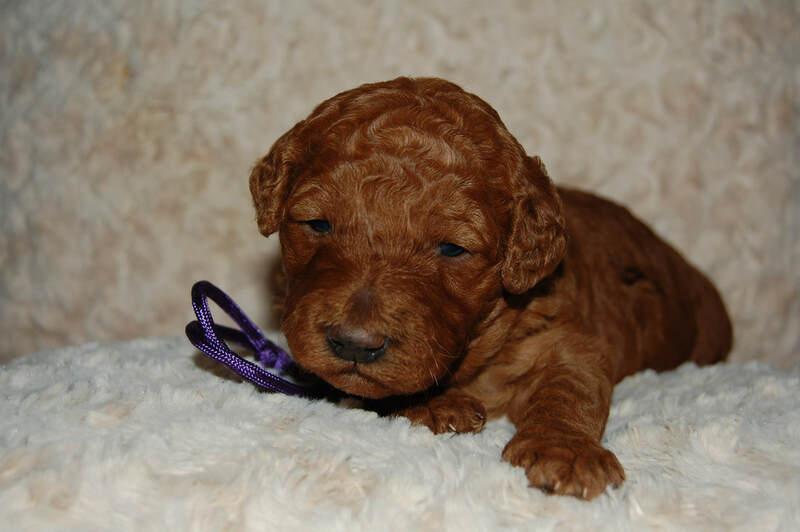 Curly solid red/apricot male, 269 grams. 2:57 PM: Mr. Green! Curly red/apricot with small white markings male 390 grams. 3:08 PM: Ms. Yellow! Curly red/apricot female with small white markings, 315 grams. 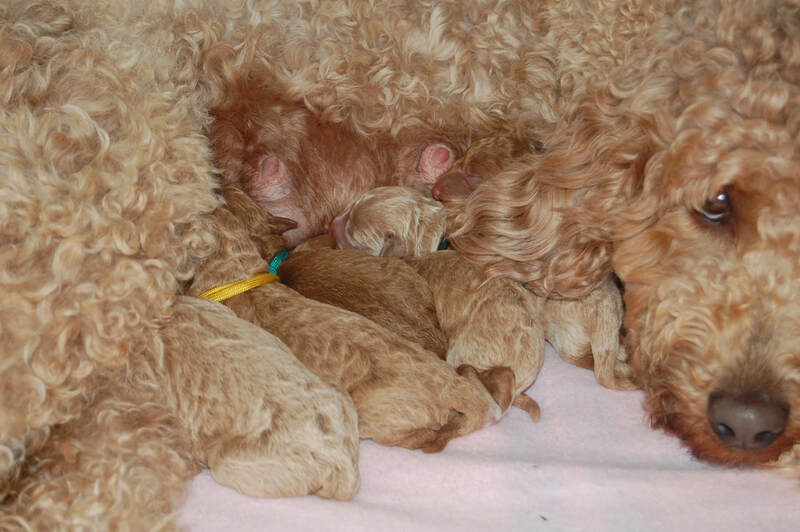 4:53 PM: The Puppy Cam and Litter Gallery (both can be accessed above) have been updated! Enjoy! 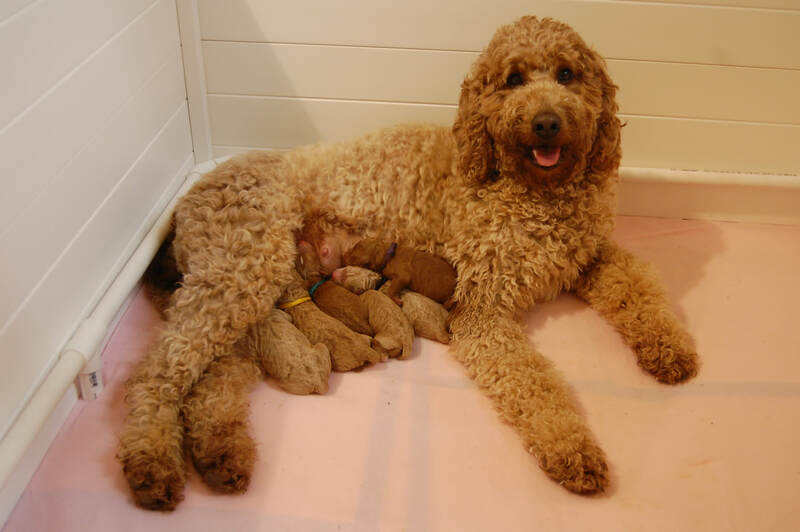 Mommy and puppies are doing very well. Ms. Pink girl is definitely the "runt" of the litter, but so far so good. 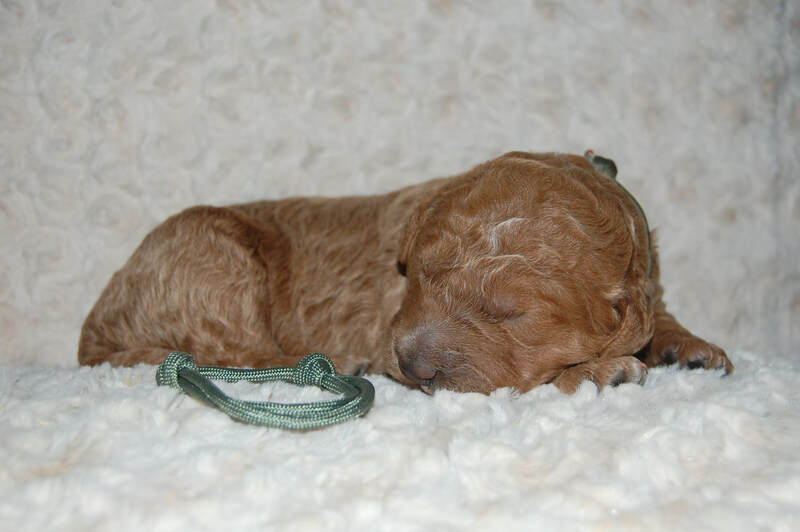 She is not wearing a newborn collar... she is so tiny that mine are all too large! I will be going down our notification list this evening to allow those who have waited to place a deposit first, but I do expect to have availabilities for this litter! Penny is expecting 6 babies! Can you see them all without looking at the labeled image?